Vitamin C or L-ascorbic acid, or simply ascorbate (the anion o ascorbic acid), is an essential nutrient for humans an certain ither ainimal species. 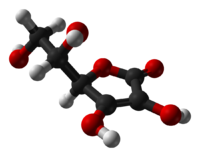 Vitamin C refers tae a nummer o vitamers that hae vitamin C activity in ainimals, includin ascorbic acid an its sauts, an some oxidized forms o the molecule lik dehydroascorbic acid. Ascorbate an ascorbic acid are baith naiturally present in the body when either o these is introduced intae cells, syne the forms interconvert accordin tae pH. This page wis last eeditit on 26 Apryle 2017, at 19:24.